East London four piece ‘Weird Dreams’ seem to be the talk of the town these days, and for very good reason. New album ‘Choreography’ is a heady mixture of hazy guitar riffs and shimmering pop tunes. It’s enough to make you think summer has arrived already. In terms of sound, Weird Dreams are probably most akin to the likes of Real Estate and Wild Nothing (who they’ve opened for previously). It’s all about the texture and depth of the sound – it’s gentle stuff, but very detailed. Throughout the record, deep bass lines form a solid base for light noodlings from lead guitar, and vocals arrangements are experimented with almost constantly. First track, ‘Vague Hotel’ is a straightforward pop tune with toe-tapping beat and a stop-start twitch with driving melody throughout. There is even a ‘hand clap’ break-down. It’s a great start to the album. It reminded me of the lighter parts of The Boo Radleys. This is certainly ‘indie’, but they’re not afraid to write a pop tune. ‘Hurt So Bad’ follows and is brimming with teenage angst and more shimmery guitars. Harmonies are important to Weird Dreams, and the Beach Boys are an obvious influence. This is probably best demonstrated on ‘Holding Nails’, where the emphasis is more vocal than it is musical. They have great voices, and with the mix of jangly guitars it’s a heady concoction. ‘Little Girl’ is a mid-tempo (almost) blues workout, with low vocals and sounding old beyond its years. It stands out from the album as it’s completely out of synch with everything else on offer here. The chorus name checks the band’s name, which is presumably why they decided to leave it in. I have no complaints, but I do feel it detracts from the layered guitars and harmonies we’ve been given so far. On ‘666.66’ we’re back to Beach Boy vocals and dreamy summertime melody. Some of the falsetto here is amazing; you really don’t hear voices like this every day. ‘River of the Damned’ is a delicious piece of low key strumming, circa early Shins, ‘Caring is Creepy’. There are a number of different themes going on in this record, and while some of them can feel a little underwhelming, others surprise with their subtle invention; and this is one of them. It’s gentle, but with huge complexity. Towards the end of the album ‘Velvet Morning’ is another delicate offering. It mulls along with quiet distortion under a strong bassline. Lead guitar takes centre stage, but it’s implied enough to not dominate the track. Weird Dreams are careful enough to not have a single musical element take over and destroy the balance of sounds. Final, and title, track, ‘Choreography’ pulls together all of the sounds we’ve heard so far; pop tempo, shimmering guitar and a multitude of layered vocals. There is even a tinge of folk in the vocal delivery that’s intriguing. Even at the end of the record you can hear new sound elements coming to light. However, while new ideas are always a welcome addition, it can detract from the cohesion of the record, as it doesn’t feel they’ve got all of their ideas spread across the whole album. What struck me about ‘Choreography’ is the way it experiments between its core sounds, whilst being able to reinvent itself throughout. It’s a light album with some strong pop tunes, but littered with softer complex pieces in equal measure. If I have anything to offer, it’s that there are possibly too many ideas in this record that stop it from being as cohesive as it could be. I’d like to see them pick one direction and develop it through to a central sound, as bands like Real Estate have honed theirs. Weird Dreams are incredibly able musicians, and vocally there is really nothing around today that can rival them. As a band, I have no doubt they will develop into a force to be reckoned with. This is a stunning debut, but I do feel they have a lot more to offer. 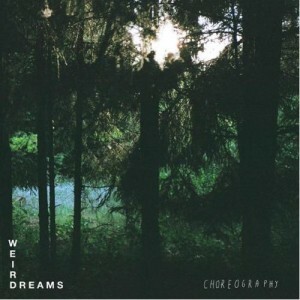 This entry was posted in Weird Dreams and tagged Choreography, Weird Dreams by admin. Bookmark the permalink.